Three for three. Three goals and three wins. 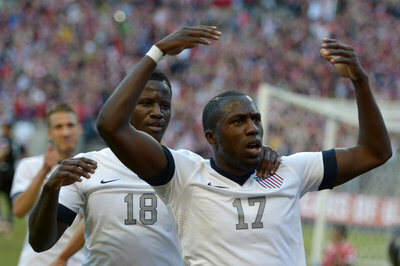 Such has been Jozy Altidore's contribution to the US Men's National Team World Cup Qualifying campaign. Altidore's return to national team form should not be a surprise given the youngster's 31 goals for AZ Alkmaar of the Dutch Eridivisie this past season. He has found his groove and bigger clubs will be after him. I must admit that I did not watch the match given my current absence from the country and the fact that the game was played at 2AM my time.Regardless of this fact, a few observations can still be made. Altidore's goals have allowed more space and opportunities for the national team and have also relieved the pressure on Clint Dempsey to provide all the scoring for the United States. Altidore is now both the target forward and a physical presence that must be dealt with by any opponent, regardless of their level. This was always Jozy, but only now is it consistent. . . and just in time. The flanks are here to stay. Weather it's Graham Zusi and Eddie Johnson, or Fabian Johnson as an option, the passing and pressure on the wings are both finally consistent. Given DaMarcus Beasley's mobility at left back and Brad Evans' positioning, protection from other teams is also available although vulnerabilities in the defense are inevitable due to injuries. Landon Donovan is an option for now but is no longer a fixture. Michael Bradly is a general and Jermaine Jones is his commander. The pair in central midfield have different attributes but both offer the box-to-box attack and defense needed by a team and system that do not utilize a number 10. The passing and recovery from Bradley are of highest importance here. As his form goes so does the team. Central defense is set. Although Omar Gonzalez can still struggle at times, his physical qualities and club history make him a fixture in the American center back position. Matt Besler is now the perfect partner with a lower profile that ensures recovery and passing from the back. Howard is a rock and will not be discussed here. 13 points are now in the bank and in a Hexagonal system that usually requires 16 or 17 points to advance to the World Cup, the US team is now positioned to make its latest appearance in the tournament. 4 games, 2 at home (Mexico and Jamaica) and 1 winnable on the road (Panama) remain. Even if the team is to falter versus our southern neighbors, a win versus lowly Jamaica is likely given the team's form. Only time will tell and there is still plenty of work to be done.